We all have blogs, isn’t it? For instance, noulakaz.net is my personal blog where I (from time to time try to) publish some philosophical ramblings about technology. That looks a lot like searching for ‘Mauritius’ but with a twist. At the bottom of the page, we have the View in RSS format hyperlink. Clicking on it opens a RSS file describing the latest 20 blog entries containing the word Mauritius. Now, you don’t have to click on this link (as the target is just some funny looking XML) but you can use it with a RSS aggregator like Apple’s Safari, KDE’s Akregator or even Firefox using live bookmarks. 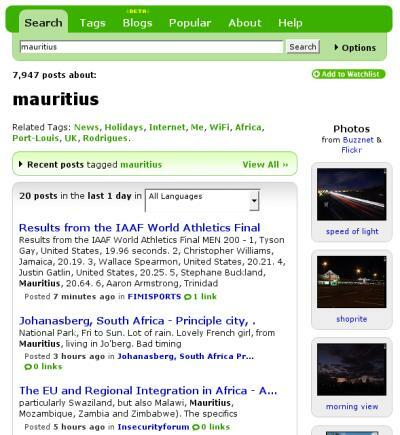 So, I can easily find the new blog entries about Mauritius without even going to Technorati’s website! That is pretty neat! Technorati rocks. I also use the tag search sometimes. Been doing this in a different way. Your solution is cool, but why not make it work for you instead of working for it? In other words, why should you have to go find your Live bookmark and select it and then click on an entry or open all in tabs when you can automate a good part of it. Make it update automatically within your RSS reader in Thunderbird. Set the interval to something like 1 minute and the folder you created will be regularly automatically updated with the lates entries. Besides, you can now use Google’s BlogSearch tool. It’s going to be much better than Technorati. 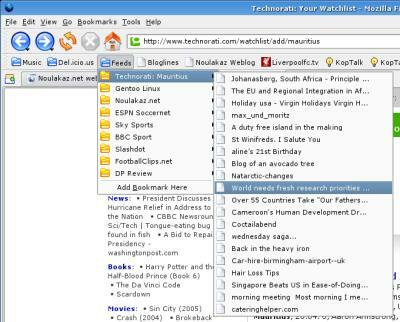 That’s what I’ve been using: Google News and BlogSearch + RSS + Thunderbird. Cooler ;) Give it a try. I have tried to use Sage (which as you know is a RSS reader extension for Firefox) for some time but I prefer the plain Live Bookmarks. RSS rocks! It makes looking for updated information so easy. Also tried Sage, but not had time to dig in its configuration. Another nice site is http://www.digg.com. The issue I’m having currently with Google’s blgosearch is that I get duplicates in my updated RSS feed. Haven’t find a way to prevent that yet. RSS is quite a big time saver, I agree. Been hooked on it the first day I used it. More and more, people will need these kinds of service because there is just too much infromation and too much happening to keep abreast of it all. 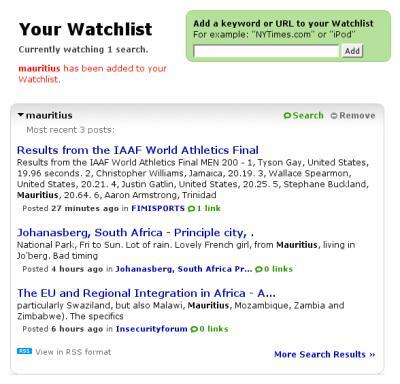 I tried Bloglines and Google Reader. I think Google Reader has a much better UI. just a quick message to let you know that the problem I had with duplicates is solved. Actually, I was querying for more entries than was being produced, which explained the recurring entries. So now, I’ve set my query within Google blogsearch to something more realistic and I have no duplicates anymore within Thunderbird.